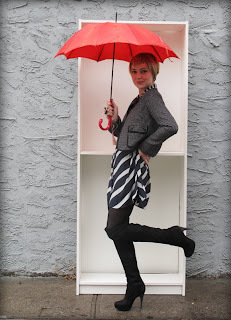 Once upon a lazy Saturday, I so conveniently stumbled upon Kelly Framel's blog, The Glamourai. With a rather lengthy list of to-do's in mind, I had only moments to get my fashion-fix before snapping myself back into reality- but something rather strange happened. My clock had somehow jumped forward 2 hours and there were multiple tabs open on my browser, displaying words like, "vintage-inspired" and "1920's clothing". When my fiance' asked what the crap I was doing, I blamed it on her... With over 5,000 blog followers, you know that there is something to love about The Glamourai. She is a Vintage addict and accessory master, which gives me reason enough to adore her- but there's something else that sets her apart from the other thousands of vintage-clad fashionistas and keeps me following. Kelly Framel's fashion creations are masterful works of fine artistry. Not to mention the fact that we share a sometimes, overly-obsessive eBay dependency.